Who: Any Youth from 10 – 30!!!! Thank you to Atlantic Filmmakers Co op for the donation of the space! smile emoticon Spaces filling up fast! Register today! 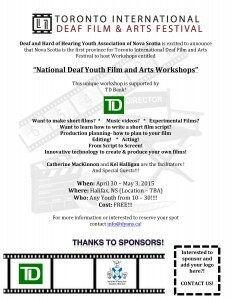 Supported by TD Bank National Deaf Youths Film and Arts Workshops!